Yesterday I went on a day trip to Coptic Cairo and al-Azhar Park. Those two places, more than any other two that I've visited in Egypt, gave me a real sense of being "somewhere else." I think I may have mentioned before that people are people no matter where you go (even if I didn't mention it before, there you have it now). There's a certain consistency in human nature that makes me feel less confused about my being transplanted into a different culture from my own. ANYHOW, for a while I thought that, considering how people are remarkably similar even given vast distances between them, there was nowhere in Cairo where I would feel really, really far from the US. All it took was one day trip to Coptic Cairo and al-Azhar Park for the very real sense of being in an ancient and foreign land to settle over me. There are a number of sites in Coptic Cairo that are thought to be places where the Holy Family (Jesus, Mary, and Joseph) visited so long ago. At one such site is a well that is said to have been blessed by the Holy Family when they stopped there. When my friends and I entered, there were some Greek pilgrims there, gathering water in bottles and reverently crossing themselves with it. 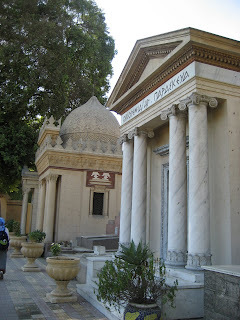 In another area of Coptic Cairo is another peaceful and strangely beautiful place: a cemetery. 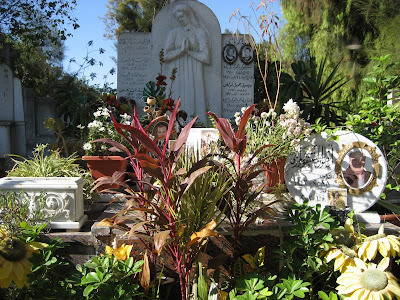 There are mausoleums that look like small churches, tombs with the occupants' pictures carved into them, graves with flowers and other plants that seem to be flowing from the graves themselves. There are pools of cooled wax from candles that seem to have been burning for years. And over it all is that fine, democratizing Cairo dust that mutes some of the differences from grave to grave. It's like a small, silent village. I almost expected to be greeted by shopkeepers, or to see children running around, or hear music winding between the statues and various architectural tributes to loved ones. Most obvious was the silence. Most other place in Cairo, one is bound to hear the honking of taxis and minibuses. 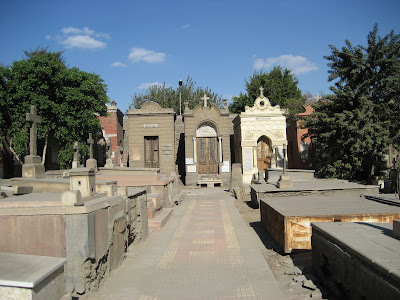 The cemetery in Coptic Cairo is restful. I suppose the people there tend to get along. One image that impressed itself on me was where two mausoleums stood as neighbors with wildly different themes. One was obviously Greek with its Parthenon-like pillars and white marble, while the other was clearly more at home in the Middle East. And then there's al-Azhar Park. It is a beautifully landscaped park on what used to be a landfill. We visited in the evening and, like many other Cairenes that night, got to enjoy Cairo's unbelievably crowded silhouette. This was one of those places where it was abundantly clear that Toto and I were not in Kansas anymore. Minarets burst up over thousands of brick apartment buildings. Modestly-dressed women walk leisurely with their husbands and children, a hijaab covering many a head. And I had forgotten how it felt to be in open spaces until we got to look down over the city; in my mind's eye I imagined civil engineers staring drop-jawed at the insanity below. Are you staring drop-jawed? Go ahead and click on the photo for a larger version. Stare. I did. The view caught me off-guard as I hadn't been out of that maze of buildings for quite some time. And then there I was, above it all. There is modernity built up right next to historic architecture. This is a land where some people can look out from their balcony and see pyramids in the distance and taxi cabs racing along downstairs. How different this is from "historical sites" in the United States. In my own home town we make a big to-do about maintaining Victorian homes built in the 19th Century. Go to Egypt and you can do handstands on a structure built before 2000 BC. If that doesn't serve to make you feel the weight of history, I don't quite know what will. My immediate thought when I looked at the enlarged picture of Cairo from above was "it looks like a war zone". But then it probably has been through a lot, at least a lot of time. I didn't realize Cairo was walled, at least in part.